Rose Quartz was Pantone‘s color of the year in 2016 but it’s still as big as ever! You’ll see this light pink through out modern homes, on pillows, bedding, art and accent pieces. Take a peak at our favorites! Add One Accent Rose Quartz Pillow to Make Your Modern Space on Trend! Love This Velvet Peachy-Pink Modern Sofa! Decorate with a Few Blush Pillows for a Monochromatic Look! 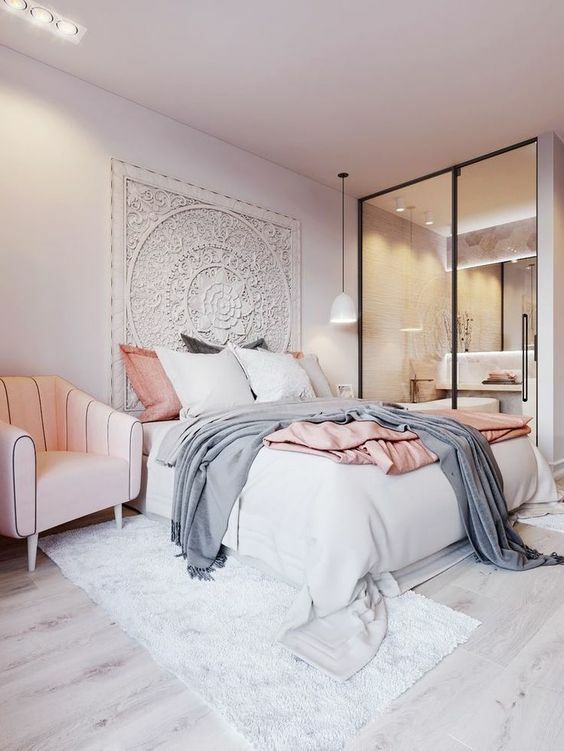 Add Pattern or Textured Blush to Your White Modern Room! Add a Pop of Modern Pink to Your Bath! Linen Bedding is Beautiful! Add a Few Decorative Blush Pillows to Complete the Look! I hope you’re inspired to decorate! What are your favorite colors to decorate with?